The Bujinkan (武神館) is the name of the international organization over sees ninjutsu training. Bujinkan means “Warrior God Training Hall”. Masaaki Hatsumi founded the Hombu Dojo in Noda City. Cecause he saw his teacher Takamatsu Toshitsugu as a Bujin or “divine warrior”, he chose this name for the organization. 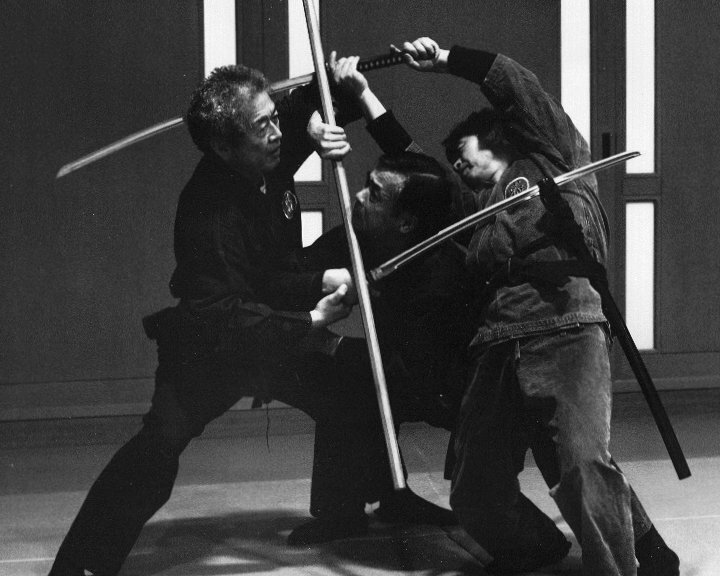 Included in the Bujinkan are nine Japanese martial arts comprise the training. Takamatsu passed these traditional martial arts to Hatsumi naming him Soke. The heritage of these arts traces to the ninja and samurai of the Iga region. Their skill sets include dakentaijutsu (striking movements), jutaijutsu (throwing), traditional mainland weapons, and modern weapons. Because of this, practitioners of the art becoming extremely well rounded in Japanese Martial Arts. Furthermore, a student must pass a 5th degree test (called the “Godan Test” or “Sakki Test”) in Japan to have an independent dojo. At this point, the title “Shidoshi” (“teacher of warrior way) is given to the student. Also, at 10th degree the practitioner earns the title of “Shihan” (“Master”). Todai Dojo is an officially recognized Bujinkan dojo. Hence, we take regular trips to Japan to train under Soke Hatsumi and the other Japanese Shihan. We invite you to try a class and see what our training is all about. Soke Masaaki Hatsumi chose to call his dojo the “Bujinkan” in honor of his teacher, Takamatsu Toshitsugu, who taught him the 9 traditions we study to do this day. The term Bujin is more than just an honorific title, but also describes a philosophy and concept of Budo. Few events are as a mind blowing, mystical, and life changing in Ninjutsu training as when the time comes for a student to pass the Sakki test to achieve Godan. It’s a rite of passage that culminates after a decade of studying our art. I came to a realization about the science about such a meta-physical type of event after passing mine in September of 2012. But what is the Sakki test, and how does it work? If you’ve ever taken a Martial Arts class at a Bujinkan Dojo, you’ve heard those three somewhat difficult Japanese words shouted at the beginning and end of class: Shiken Haramitsu Daikoumyo. These words have profound significance – but only if you understand what they mean (much less say them). Here we’re going to translate this Buddhist mantra, and the meaning behind one of the most often used phrases in Bujinkan training. If you have ever trained in Japan, you have heard Soke talk quite a bit about the Kukan. Kukan roughly means “space” or “opening”. This can (and is) often be interpreted in a number of different ways. I find it easiest to think about it as “an opening where your opponent is vulnerable”. As simple as that sounds, it can be difficult to find that opening since it is so fluid.